The effort to catch Julio Nivelo has been dubbed "Operation Lucky Charm," sources said. 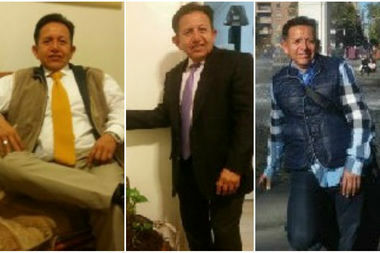 MANHATTAN — The suspect who scampered off with $1.6 million in gold flakes from the back of an armored truck in Midtown and is a suspect in at least seven other crimes in the Big Apple in 2016 was captured in a beachfront resort in his native Ecuador, police said. Investigators were staking out a hotel in Mantanita for several days when their suspect, Julio Nivelo finally emerged and was grabbed by federal agents and local police who were tipped off by the NYPD. NYPD detectives had been tracking Nivelo since he hit the jackpot on Sept. 29 when he grabbed an 86-pound bucket of gold flakes from a Loomis Armed Car on West 48th Street near Sixth Avenue, and then was videotaped lugging his haul across town. NYPD detectives were on his heels as he traveled south to Miami, where sources say he paid $5,000 in cash to an acquaintance to drive him across country to southern California, where he has several relatives. From there, investigators bet that he would again head to Ecuador, where he had previously been deported four times after serving stints in state prison in 1994, 2001, 2005 and 2008. His photo was widely circulated in his native country, and he was finally spotted and captured early Thursday by local police and Immigrations and Customs Enforcement officials, police said. In addition to the Loomis gold flake heist, Nivelo, who specialized in targeting unattended delivery trucks, was suspected in a recent spree that dates back to last May on the Upper East Side, where he made off with a variety of electronic equipment and Jimmy Choo shoes. Officials have yet to recover any of the stolen gold, and wil be questioning relatives and friends. Nivello is expected to be arraigned Friday in Ecuador. If he returns to New York, he could face a couple of years more in prison for grand larceny charges. He could receive more time in Ecuador where he also faces those charges, sources pointed out.